A member of "Ayadi Al-Khayr" Charity, Al-Sayeh Al-Zanati, said on Saturday that they have launched a program to distribute food aid to displaced families in the city of Tarhuna. 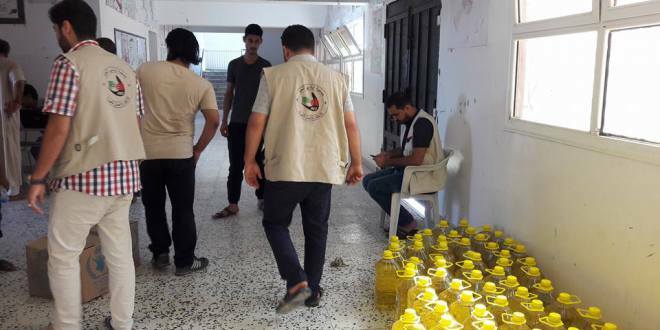 In a press statement, Al-Sayeh clarified that they have sent an aid convoy for 600 families of the displaced people of Sirte and Tawargha staying in Tarhuna and its outskirts, noting that the convoy was funded by the United Nations World Food Programme. He added that "Ayadi Al-Khayr" had distributed food aid to 450 displaced families in Bani Walid town, and aims to reach out to another 1,650 displaced families of Benghazi and 1000 families of Tawergha IDPs in Tripoli.